5-Stage System makes up to 350 gallons of fresh water per day. 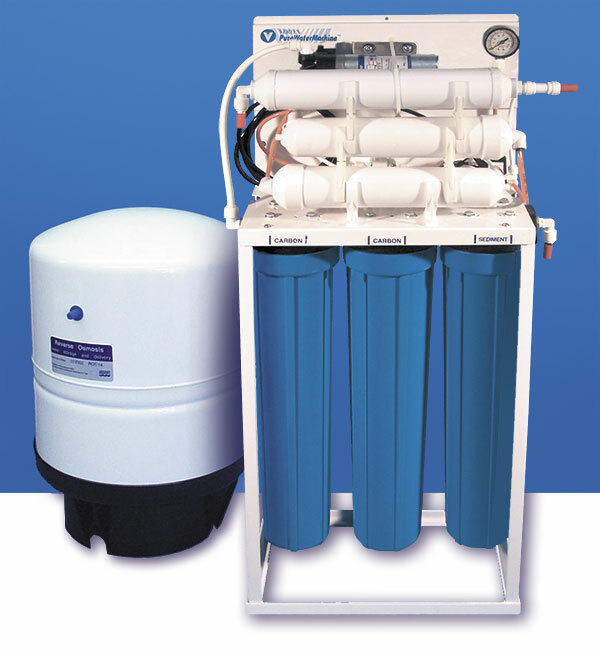 Up to four high-capacity RO membranes are used to provide the required water rate. Diaphragm pump with high pressure by-pass powered by 24/36 volt DC motor. 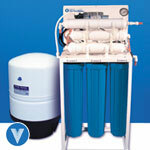 5-Stage System makes up to 350 gallons of fresh water per day. de-ionizer cartridge can be installed as a post-filter option. The five stages are described in the table below. psi pressure gauge indicates the pressure to the inlet of the membrane. The overall duty cycle of the pump is 50%. The unit can be wall mounted or floor-standing with an optional stand. The stand is made of powder coated steel and bolts to the underside of the bracket.